Dwellings and greenhouses in the tissue are detected and sorted in clusters. When the units are within a radius smaller then (D), the neighbour distance (in the analysis of out 1km2 sample tissue, shown on the right, D is set to 12 m.), then they are determined to belong to the same cluster. Inside the cluster connections are made between the units. The units are saved in a list of clusters to further categorise into distinct types. maximum radius to search for units to join in the same cluster. Study of the topology of the dwellings and greenhouse clusters in our sample tissue reveals a range of possible relationship structures between adjacent units. Five unique types of relationship were identified as representative of the variations within the tissue. Most of the continuous connected structures within the tissue can not be described as being solely one of these types, but rather are a combination of these. These combinations will inform the development of the new combinatorial types. Another emergent property in the tissue is the relationship of dwelling and greenhouse units. Instead of only looking at the individual units and their connections, we also have to look at the relationships between these types. A few typical relationships can be extracted, from parallel clusters aligned side by side, to different degrees of enclosure, up to fully enclosed loops. As with the previous exploration, within single clusters many different combinations were found, where one cluster for instance, can have multiple enclosed neighbouring clusters. This data will suggest tactics for differentiation of public, semi-public(communal), and private greenhouses in further steps. In addition to their topological type and the relationships between production and dwelling units, the individual units can be further classified by their connections back to the primary network. - Topological type of the containing cluster. - Relationship to greenhouses and public-ness of access ways. - Proximity and orientation to the network. 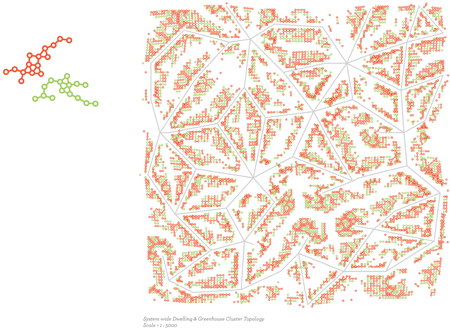 - Relative depth within the larger dwelling clusters.